The Oppo A7, which is all set to be launched in China on November 13, has recently leaked on the internet in a set of images along with specifications. The recently leaked renders of the A7 provide a detailed look at the phone design as well as its features. Checkout below. With A7, Oppo is set to begin a new A-series of its smartphones. 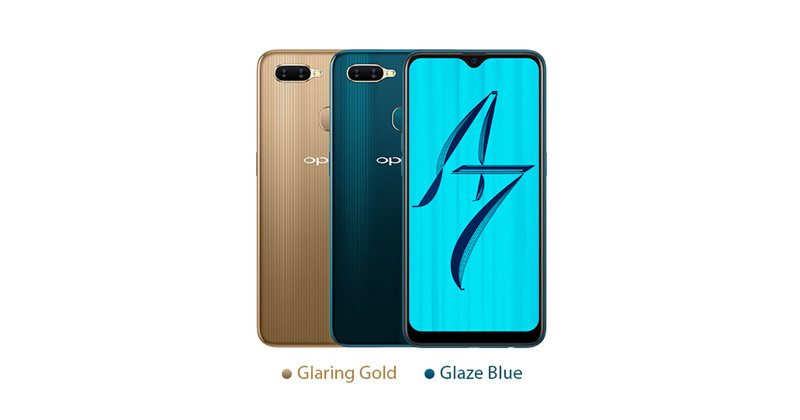 The leaked images of the Oppo A7 show the images in two color options including Glaze Blue and Glaring Gold. In terms of specifications, the smartphone will be powered by a bigger 4,230mAh battery. The highlight is the waterdrop notch present at the top of the full screen display of the phone, which makes it look similar to the Realme 2. It is also being expected that the Oppo A7 is simply a rebranded version of the Realme 2 and will have similar specifications. Let’s take a look below. The Oppo A7 is expected to be launched in China on 13th November 2018, while the global launch date is not confirmed yet. It will cost around RMB 1,599 in China (approx. Rs 16,900).